When you asked if I could draw you, I did it. When I finished the very rough sketch you asked if I could make it look “cartoony”. I did. When I was done with the lineart you said that it was okay and took it off of my desk. Then you signed my art. The art that I put effort into just to make it good enough for you. I knew if I hadn’t put in enough effort then you would have just hounded me to do so. You then asked for my colored pencils. Well, technically you took them off my desk too but, you got a hold of them either way. You then proceeded to color my drawing very messily. You know if you wanted it colored, I could color it for you, right? All you had to do was ask me. I never stopped any of it though. I’m just not the type to speak out. It wasn’t until about two weeks ago that I had confronted you about it. You asked if another girl could make you a drawing. When she said no you came to me. 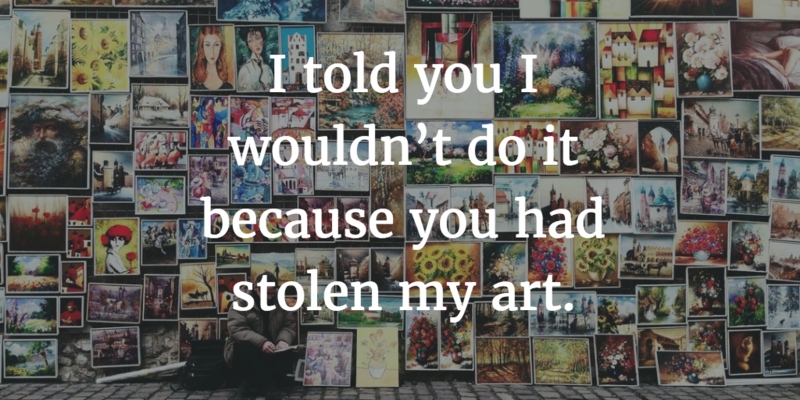 I told you I wouldn’t do it because you had stolen my art. You had said that you signed it because you wanted people to know it was you, even though it was obviously a signature. Not to mention the people that had come up to me asking if I made the drawing and saying that you were claiming it was yours. I told you that I wanted to make a career out of my art and you apologized, but now all I can think about is how anyone could claim my work as theirs and even possibly get farther in life than me with art.